Love your depth of field and her concentration on blowing that PERFECT bubble! Not sure about the lighting. Suggestions? Your light is pretty close to horizontal, which may be OK for early morning. The main issue is that there's no ambient light - out doors there'd be light from the sky stopping the ground from being so dark, and some light bouncing up from the floor taking the darkness of things like the hatchback door's underside. Try adding an uberEnvironment light (if this is DAZ Studio) using the KHPark preset, and then lower the intensity a bit if it's too bright (and apply one of the higher quality presets before doing a final render, but the basic preset should be enough to judge how it affects the lighting). Thank you for the feedback Richard. I did have the light higher in the sky but then I had a really dark shadow on the child in the car. Since I envision them spending the day at the beach they are getting an early start so I lowered the light closer to the horizon but it still did not look right. I have tried many different light settings. Some I have created from scratch and some purchased/included set-ups. None seemed to work. I will try your suggestions when I get home. Well if you are going for a sunset type of light, the sky is a bit bright for that. I would consider darkening the shade a bit and perhaps adding a bit of reddish to it. That would tie the sky into the red of the characters better. Also, is the red on the characters applied to the skin or to the lighting? If just to the skin, I would consider adding red to the lighting, backing it off on the skin a bit if necessary. Basically, the colors/lighting aren't tied together in the scene into a coherent 'end of day' way. Not really a WIP for the contest, as I consider myself an experienced Carrara user, but what's a Fun in the Sun thread without a bikini car wash? You wouldn't perchance be the one in the car, lol? Made me smile. Don't know who is having more fun in the scene! I've always been a fan of yours. LOVE your art! Nah! I'm not that thin! Thanks for the compliment! It was fun setting it up. It's one of those rare images where 95% of what you envision is achieved! Make sure that bright thing (what is it--a magic spell she is casting?) is an actual light source in the scene. Maybe put a point light there and turn the intensity way up. On your other WIP, I think the rendered characters look great--good job with the lighting and posing--but when viewed at full size, they don't seem as if they "belong" in the background scene. Not quite sure how I'd recommend improving on it, except to say that it might be a situation in which some postwork is called for. Very clever idea! If you can turn the surface of the sun into a light source it would be even better. What software are you using? hello. i'm a newb. i just downloaded Daz and started messing with it 2 days ago, lol. just posting this as a goofy idea. it's rough and i'll clean up her swimsuit later. i only have the free download, so it's the genesis 2 figure and genesis wardrobe. the rest was modified in gimp (which i'm also trying to learn). i guess i'll need to learn hexagon or blender later on as well. i think i used two distant lights. one in the front and another to the side to lessen some of the shadows a little. i might go back and tweak the model. i didn't even know about the contest when i made the render, heh. any comments and ideas on improvement are appreciated. anyhoo, nice to meet you all, and i hope to have fun and learn! I like it better with the plants. There's something weird happening with the rock on the far right side of the image...look at its shadow. Kind of breaks the illusion that it's an actual rock on a beach... Perhaps try rotating that piece on the y axis? Nice to see Kielan again. : ) Good job with the custom pants texture (though might be even better with some bump and/or displacement added). Carola O: Hi again... your render is improving, but lights and shadows are still quite off. There is something unnatural that make the render look like all the figures and props are cutouts stuck onto a background, with additional shadows added somehow. My suggestion would be to go to scene panel and remove all the lights you have in the scene, then create only one distant light, orienting it as coming from 35 degrees top right and set the shadows that light uses as ray traced. Then add another distant light with its characteristics set from your main camera (the one you use for the scene render), but setting its power/intensity to a very low value (0.1 might work) and no shadows. Try rendering with only those two light sources and see if all blends together better. I like this a lot. The water looks like real water, but not necessarily like a real ocean or river. I think it should be tinted: maybe teal, or a murky green or brown, depending on what the body of water is supposed to represent. I'd also like to see some smaller plants in the mix too (seems odd to have so many trees and shrub-sized plants, but no grasses or small herbs). Title - Fun in the Sun? Seriously? The poses are either from scratch, or modified presets. The bald guy has a modified skin texture; both trousers have jeans shaders on them. The top of the girl in front has a texture shader, too. Lights is one Distant Light (pale yellow), and an Uber Area Light. I haven't done anything with the hair, yet. Ideas on what to improve? This is a nice start. The woman in pink appears to be floating in the grass rather than resting on the ground, though. Not sure if that's actually the case, or if it's an illusion. The parts of their bodies that are on the ground should have some grass showing in front (like the woman in black does). Carola O: hehe well i love photography,art and mostly all PC related, though i only have started with daz some weeks ago (had used Poser in the past, a really old version, maybe 4 or so, but i abandoned it seeing i couldn't do much of what i wanted to). Anyways, i thought i could explain better using your render (the last posted, which is the best so far imo) and *cough* drawing on it (sorry...) for having some reference points: from what i see there are at least 3 light sources in your scene now, and i indicated their approx positions with the colored X. The one that matches the best the cyclorama lighting is the green one, which also causes some very soft shadows that i highlighted in green as well. I think that light is the one you should make as the most important for having a good blending of the scene. Then there has to be one which gives front light to the guy, the one i marked in yellow, and that imo should disappear from the scene or be made a lot softer, because it's coming from a direction that does not match with the background and contrasts with the other shadows on the sand. 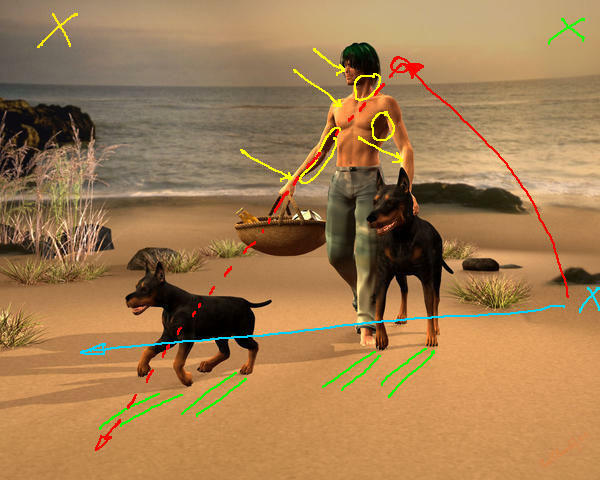 I indicated the highlights and shadows that are projected on the guy in yellow too. Finally there should be a spot or pointlight somewhere in the right (that i marked in blue). I think that light is one you can use, but should be moved roughly where i drew the red circle. @ Kesh - I did understand so no worries, english isn't my native language either truth to be told *smiles* Now.. as for the yellow marking, the light that was there was used to soften a little as Kielan and Graip (adult dog) looked a bit too dark in my eyes, without any shadows active as it was only a fill light so to say. The one you marked as blue, is approcimately where my main Spotlight is, the one that gives the stronger shadows. I did move it a little as per your advice, but I didn't like it where you put the red marks so it only got moved a little bit *smiles* the one you marked as green, is in approximately that area, slightly lower. and it's a area light plane, only used to give more natural shadows to the plants. The angle is different since the main use for that plane is for the plants, but a little of it do end up on Kielan as well, though if I change the angle of the plane it gives the plants shadows that doesn't match the rest of the light/shadows. I bow to your last render... much better in my opinion - Now the cherry on the cake would be a bit of Depth of Field in the camera setup, so you can focus well the characters and have a bit of blur on the panel and the farther plants... (ok i confess i have a slight sadistic grin on my face now... a bit like my avatar ^^ ). About what i said regarding the guy's pants... my mistake - they had indeed shadows on (tries to look innocent). Kesh needs to buy a new pair of glasses! It was a lighter one, I did one that is slightly more visible.. not entirely sure which one is the better but this works for now. Also did a few other changes, to touch up on things I was quite dissatisfied with. I tried to apply the suggestions for lighting from Richard Haseltine and Gedd. I applied the UE2 Environment with KHPark as per Richard and applied a slightly yellowish tint to the Daylight as per Gedd's suggestion. I am having a problem with the redness of the skin...especially on Victoria's face. I was hoping the light settings would correct it but it is still there. Can anyone suggest anything? Any other suggestions regarding the lighting? For the red hue on vic's face i think there's very little you can do, unless in the materials (under surfaces tab, skin, face) in the relative diffusion slider there is a pink/red color, which you can then change to a pure white. If that slider already has a base of white color, then it is probably a skin/texture thing. So either use a different skin or you can try to change the color of your main light to something more cool, like a cyan/greenish hue, but that would also change the overall tones of all the other objects. Nevertheless, may be worth a try. Another suggestion: the kid is a bit dark, but he's holding something that might be a console game? Light that up and have him brightened by it ^^ - just add a point light with a bluish hue and a low intensity (0.2 max i'd say) positioning it just above the gameboy (or whatever it is). That will help you add some light in the car and in particular to the kid's face. Just tweak it so that it's there but it's not there... meaning you just have a slight, very subtle effect. I'd use no shadows on that light. As a last remark, picture framing: your main characters have been brutally amputated at their ankles ^^ why oh why? Do they wear awful shoes that you don't want to show us? OK, joking.... but try to have em framed wholly in the picture or choose a closer take and cut their figures at knee level (so called 'american plane' in old school filmography) because having just the feet left off of a picture is generally seen as a fault, not as something intentional. Has Cast Shadows been turned off on the car? It seems not to be producing any shadowing, which looks a little odd. The “toy” the kid is holding is actually a gun from the SciFi Firearms Pack scaled down in size. I tried using a point light, then a disc light on the ceiling of the SUV to simulate an interior light but they didn’t seem to offer any help in the way of reducing the shadows so I resorted to a spot light with a tight focus, no shadow and intensity at 50%. @ Richard Haseltine – I checked and as far as I can tell the cast shadows is turned on on the car. The Background is a Image, that means no shadow from the Car is falling on the Ground in the Render.